Mackley was on hand to assist the Environment Agency with clearing a 600mm dia storm drain over the Easter weekend, protecting homes and businesses in the Calmore area of Southampton from flooding. On Good Friday, CCTV footage revealed a section of the storm drain had collapsed, causing a blockage. With heavy rain forecast for Easter Sunday, the Environment Agency acted swiftly to head off the danger of flooding. The work was carried out by Mackley working as part of Team Van Oord, who are the lead supplier to provide ‘incident response resources’ to the Environment Agency’s operational teams in Wessex, Solent and South Downs and West Thames. On Saturday (31 March), Mackley mobilized a tracked excavator and crew to the site to locate the blockage. 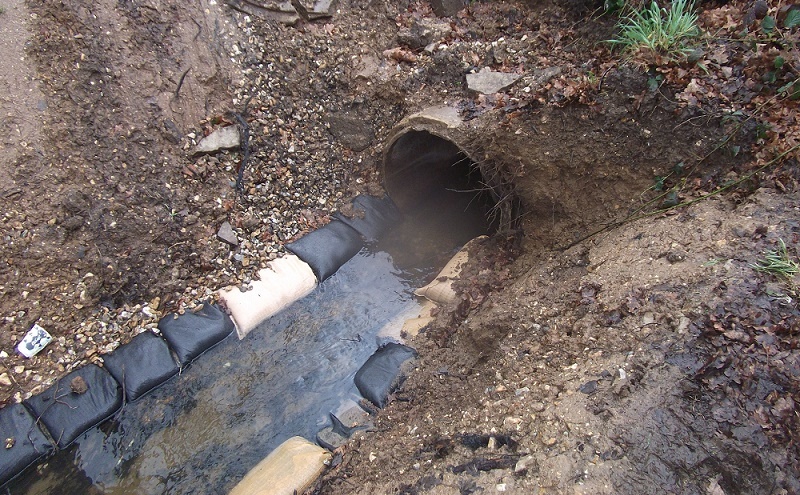 The damaged pipe was removed and a ditch formed, which was temporarily lined with sandbags to prevent scour. The area was fenced for safety and a full CCTV survey of the entire length of the culvert is now being arranged. Following the survey, a decision will be made as to any further works that may be required. Mackley will then return to site to complete the repairs and reinstate the site.